Organic? Or Just the Way it Should Be? Tonight I picked my first real tomato harvest. The tomato plants have been a little slow to produce this year. I’m not sure if it’s because I transplanted them a little late this spring or if they are having a hard time with the heat. Luckily we had a pop up thunderstorm blow through yesterday evening so the garden got a good soaking. These are all roma tomatoes except the large yellow-ish one at the top of the picture is an heirloom pineapple tomato. Some of these guys are a little damaged but that’s okay. 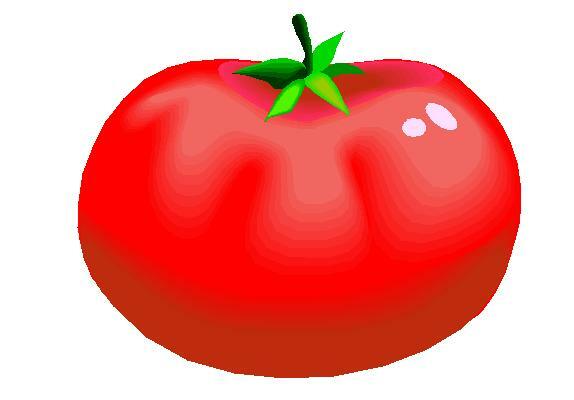 Tomatoes with “character” are the ones that always taste the best. 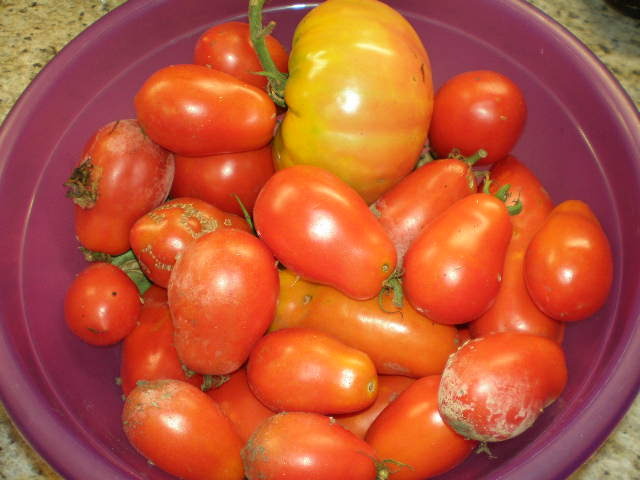 I may just have enough to make some tomato basil sauce this weekend. 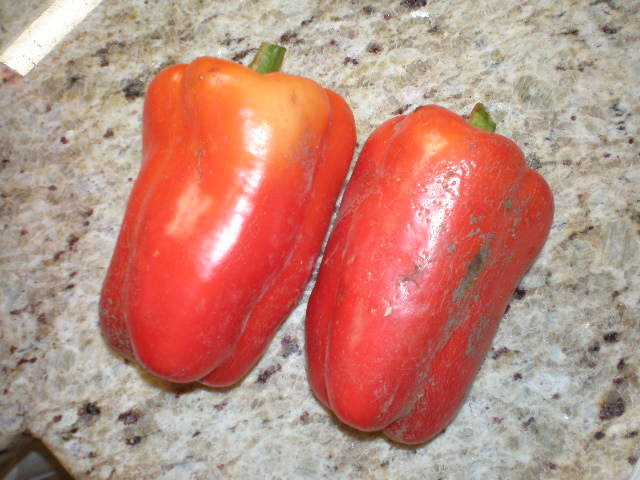 I also picked two red bell peppers. The peppers are also slow to produce this year. Like I said it could be the late transplanting or the heat. Or something else I’m completely unaware of. I used one of these peppers along with two from the store to make rigatoni peperonata tonight for dinner. It was just as good the second time around. As I was chopping up the peppers I got to thinking about my garden and how the peppers and tomatoes I had just picked were pretty organic. Although I have in the past, this year I haven’t sprayed any chemicals or used any fertilizers in the garden. I just planted seeds and let them do their thing. When I think of my garden I never really think of it as being as organic garden. When I tell people about my garden I don’t say “oh I have an organic vegetable garden”. I just say “I have a vegetable garden”. But I don’t necessarily go crazy about making my garden organic. Sure I don’t spray anything on it or use fertilizers, but I also don’t always use organic seeds and soils. It seems to me that the word “organic” has come to have this special meaning behind it; that these vegetables were handled with great care and concern. But isn’t that the way it should be? Shouldn’t all vegetables be grown with care? Shouldn’t organic be the norm? I wish organic produce was more affordable and widely available. I wish more people were able to include organic fruits and vegetables in their diets. Because that’s the way it should be. Vegetables should grow outside in the dirt and sunshine without chemicals and fertilizers. They should be allowed to do their thing. What do you think? Does “organic” mean something special? Or should it be the norm? Organic is totally the norm! We introduced pesticides and chemicals in the 1930-40’s, when plant nutrient cycles were discovered and scientists thought they knew everything about plants. Since then, chemical agriculture has proliferated to become the norm, ‘conventional agriculture’. Before that, organic was normal. Organic really is the normal way of growing food. It’s silly to think we need certification b/c conventional still exists. Permaculture is farming in nature’s design. What could be more normal than nature? At least that is how I see it. I found your blog via Courtney Carver, cool site. I am also trying to be vegan (at least at home) and get into gardening. Have a nice weekend! I find that it’s a lot easier to eat a plant-based diet at home. It’s when I leave my home that I get into trouble. But every little bit counts! I love your thoughts on this. I grow my veggies without using anything on them and this year I let my neighbor have a part of my garden and he put something on them to keep weeds from coming up and it burned holes in the leaves!! Why do we think chemicals make our gardens better? I agree with you 100%! But I wonder if natural pesticides would make the food non-organic. I’m talking about natural oils and soaps mixed with water that do not contain any pesticides or other chemicals. There must be a happy medium between just planting and hoping the bugs don’t get them, and the use of horrible pesticides and chemicals.